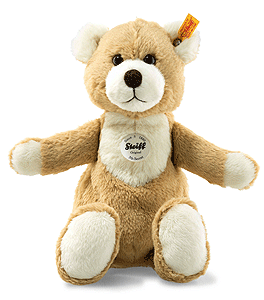 Mr Secret Teddy Bear is hand made in the finest beige and cream cuddly soft plush and carries the famous Steiff Button in ear with Yellow tag. 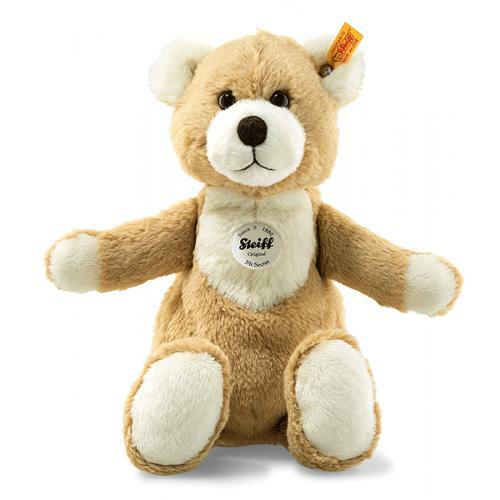 The entertaining Mr. Secret Teddy bear is beige and 30 cm tall. He has a cream colour adorning his paws and the soles of his feet. Mr. Secret keeps any messages or objects entrusted to him in a zippered compartment on his back. A white chest and white inner ears create a cute look for this Teddy bear. An airbrush technique is used to create the brown bridge of his nose and his mouth, adding to his cuteness. Made from incredibly soft plush fabric. Ideal for playing and cuddling.